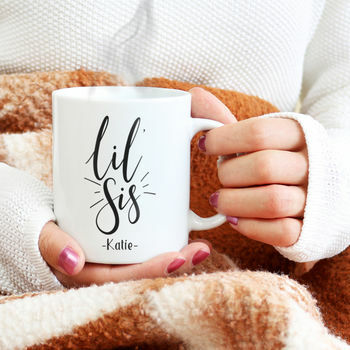 Personalised sister 'Lil Sis' mug. This personalised ‘Lil Sis’ little sister mug makes the perfect sentimental gift and is sure to bring a smile to the recipients face! The design has been hand lettered by Hope and Halcyon and is exclusive to Notonthehighstreet.com.